I've been busy stitching and finishing some exchanges and now I can finally share them with you. The first one was given to Nancy K. for the "And A Forest Grew" exchange on the USEBB. I really fell in love with this design from Cross Country Stitching magazine and I knew that Nancy was a fan of primitive designs. I really enjoyed stitching this one and my daughter came up with the novel idea of using twisted paper and raffia as the edging materials. for the "Freebie " exchange on the SBEBB. 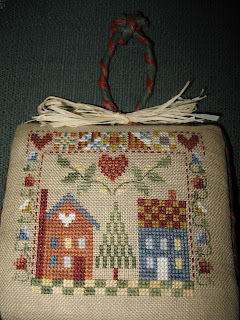 I chose to stitch Little House Needleworks Garden Gameboard. I made it into a tote bag. This was a challenging and time consuming project and I'm proud of how it turned out. Thanks for reading my blog, and please know that I really appreciate your comments. Both exchanges are gorgeous, congratulations! Oh what a super cute tote bag! Adorable exchanges dear! i like them both! 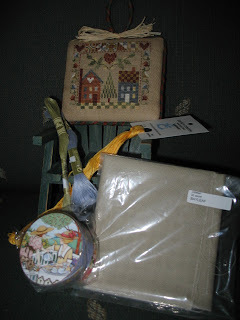 I just love the bag you made - so cute to finish the gameboard that way! Congrats. Hi Julianne, I just found your blog from Vonna's .. I love your exchange pieces! 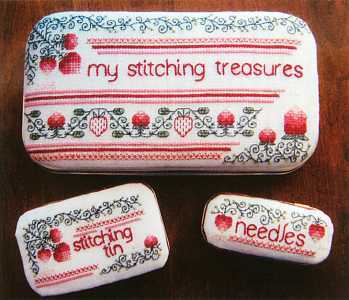 Lucky lucky recipents :) Thanks for sharing your stitching .. Oh! !There are so cute! !Nice tote bag! Oh to be able to finally post :-}So many of us are busy working on exchanges and are unable to show them off, it is nice when we can. Your exchanges are beautiful! I love the small gameboard. Great idea for finishing that one. You did a wonderful job: your finishings are perfect, especially the bag!!! Both of the exchanges are so pretty. I love the bag finish idea. Thank you for visiting my blog, I'm happy I found yours :) Both exchanges are wonderful, great finishes! I've found your blog at PS wreath SAL page and I'm new to there! Both exchanges are really beutiful and cute!! The raffia idea is really nice and the tote bag is so cute! TbOmZ5 Your blog is great. Articles is interesting!